What is Early Childhood Literacy? When I tell people I’m a children’s librarian at the Kenton County Public Library who specializes in early childhood work they usually ask me if I teach babies to read. That is not what we do at the library. We teach children and their parents how to develop early literacy skills. Early literacy is what children know about reading and writing before they can read or write. When children have strong early literacy skills they will be ready to learn to read. To read, the whole brain must be used and it takes a lot of practice to learn. Luckily, it is easy and fun to develop early literacy skills in young children. Everyday activities like talking, singing, playing and of course, reading, all work together to help your child be ready to learn to read when the time comes. Here are a few ways to help the children in your life become readers. Talk with them. Not just near them. Make eye-contact and give them time to respond. When your baby or toddler makes any noise in response react positively. Actively play with your children. There is no gadget better than an engaged adult. Peek-a-boo, pretend play, blocks, trucks, and (my favorite) enjoying the outdoors all help your child develop a wide variety of early literacy skills. Share music with your children. Music can build family bonds while developing several key early literacy skills. Sing, listen to music together, and don’t forget to dance! Read every day. If your child can’t or won’t sit still for a book don’t worry. They can listen while they are moving. My son learned to walk and didn’t sit down for a book until a year later and he had grown into a strong reader. You also don’t have to read all at once. Little moments count too – waiting in the grocery line, during bath or meal times and waiting rooms are perfect places to use books. Don’t forget, there is always storytime! Show your children our world. Point out the colors, shapes, letters and patterns that surround us. Pretty soon they will be pointing it all out to you! It’s also important that children have positive early experiences with books. 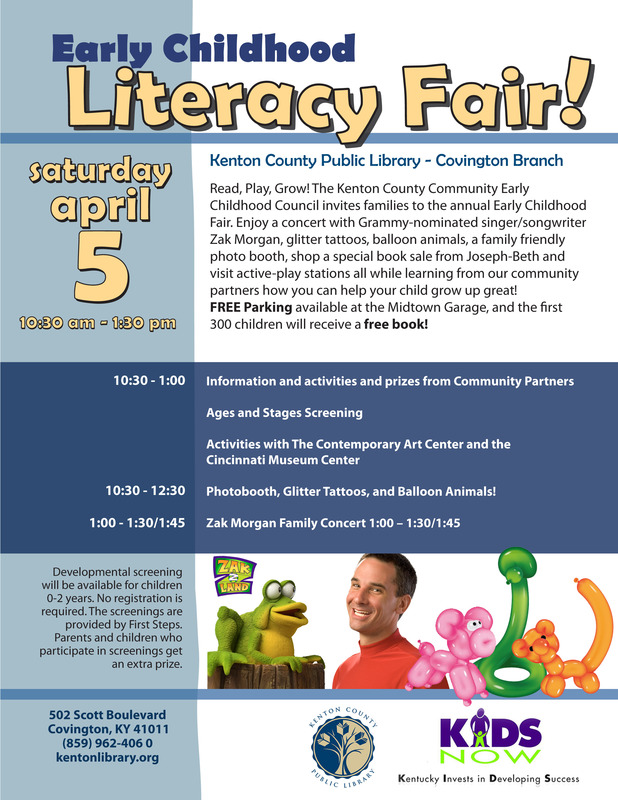 The library is hosting the annual Early Childhood Literacy Fair on April 5, 10:30-1:30 at our Covington Branch and this should be one of those experiences! The fair is funded by the Kenton County Community Early Childhood Council. At the fair you will find a family photo booth so you can remember the day, activities from the Contemporary Arts Center and Cincinnati Museum Center, great information for a variety of agencies and companies and at 1 p.m., a family concert with Zak Morgan. The first 400 children will receive a free book and there are plenty of other trinkets for children to collect while parents are picking up information. Children under 36 months can complete a developmental screen with their parents for special prizes. This post was written by Amy Schardein, early childhood literacy librarian. Learn more about Amy and storytimes.